PAUL Tuddenham resolved early in his career that he was never going to feel suffocated by his surname. In the end, it was injuries and at times a lack of opportunity, which prevented the son of one of Collingwood’s most famous players, Des Tuddenham, from making a more lasting impact on the Magpies’ fortunes during the late 1980s and early ’90s. A forward with good finishing skills and a confident demeanour, who could also have a run on the ball, he was four centremetres taller than his father. Even though his time at the club was relatively brief, he still managed 40 games across five senior seasons from 1987 to 1991, kicking 32 goals. For a time, it looked as if he might do what his father couldn’t (despite his best efforts) – play in a Magpies premiership side. Sadly, for Paul, an ill-timed injury and losing favour at the wrong time of the 1990 season saw him overlooked in the club’s drought-breaking first flag in 32 years. Des had played 182 games with the Magpies – and a further 69 with Essendon as captain-coach. Paul was born in September 1967, less than a fortnight after his father had captained the club to a losing first semi-final encounter against Geelong. The Magpies eventually did. He first come under notice of VFL clubs when playing with his school, Xavier College, and started off in the Collingwood under-19s, before graduating to the reserves. He eventually got his senior chance in the penultimate game of the 1987 season against St Kilda at Moorabbin, wearing the No.46 jumper. He kicked two goals against Essendon in his second game – the last home-and-away game of 1987, prompting an upgrade to the No.6 jumper in 1988. Tuddenham played six of the first nine games of 1988, before injuries and form saw him out of the team. He returned for two more games and one final late in the season. He had his best pre-season ever in 1989 and approached the year the fittest he had ever been – probably up there with Mick Gayfer as the fittest bloke at the club. He played 10 of the first 14 games, and at last appeared to have found his niche, with one scribe calling him “the most improved player at the club.” He was handy on the forward line, where his reading of the play, good goal sense and precise disposal came to the fore. He was also deceptively strong, and hard at the ball. But a collision with teammate Ron McKeown at the Western Oval against Footscray ended his season. 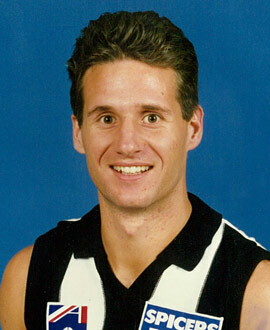 He returned in 1990 and played the first six games, twice kicking bags of four goals in a reshaped forward line. But he was in and out of the side thereafter, not appearing in the seniors after round 14, when he strained a hammy against West Coast. Things didn’t improve for him in 1991, playing only nine games for the season. Then he did an ACL while training with the reserves. The club was still prepared to keep him, but only on a reduced deal that Tuddenham wasn’t happy with. So he entered the national draft and was overlooked before Carlton selected him in the pre-season draft. Returning from his knee injury, he played 13 reserves games for the Blues but never cracked it for a senior game. Later, he tried out briefly at Fitzroy without success. But flags did come for Paul Tuddenham – first with Old Xavs in 1995, and then with Port Colts, with his father as coach. Those provided a nice full stop on a footy career that never quite reached the heights it at times promised to.